Think of Charleston and chances are you'll think of history. The city truly does stand as a living monument to the founding and evolutions of our nation as hundreds of beautifully preserved structures from the colonial and antebellum periods grace the city's narrow streets. But what does this historical heritage have to do with golf? Well, plenty, as it turns out. Over 200 years ago Charleston was the site of America's first golf course and golf club. In 1786 the South Carolina Golf Club and Charleston Green were established in what is now downtown Charleston. 130 acres of golf links were opened in 1891 surrounding the Pine Forest Inn, which became a popular resort for locals and visitors alike. The inn was located in the Summerville area of Charleston which also was the home of the Country Club of Summerville, a course that featured bermuda greens as early as 1925. Today, Charleston offers a variety of challenging and visually stunning golf courses. World-class architects such as Tom Fazio, Jack Nicklaus, Arnold Palmer, Pete Dye, Rees Jones, Arthur Hills and Robert Trent Jones have all worked their magic on the area's lowcountry coastal terrain. 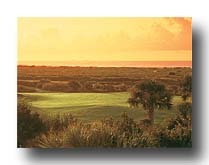 The acknowledged big three golf resorts in the Charleston area are Kiawah Island, Wild Dunes and Seabrook Island. 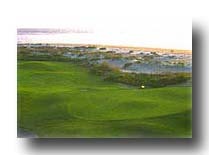 All three are full service resorts with multiple golf courses. Kiawah was responsible for bringing quite a bit of publicity to the area by hosting the thrilling 1991 Ryder Cup Matches on the awesome Ocean Course. Kiawah also has Osprey Point, Turtle Point, and Cougar Point. All three of these resorts are ranked 4 stars or better by Golf Digest, with Kiawah's famed Ocean Course leading the way with 5 stars. Seabrook combines the exclusivity of a private club with the full services of a premier oceanside resort. Seabrook's two championship courses, Crooked Oaks and Ocean Winds are only available to resort guests. Wild Dunes is located on the beautiful Isle of Palms and boasts two terrific courses. The award-winning Links Course was designed by Tom Fazio and features spectacular finishing holes on the Atlantic Ocean. The Harbor Course, also designed by Fazio plays along the Intracoastal Waterway. In addition to these great resorts, there is more great golf available on other Charleston area semi-private and public courses. Some of our favorites are the Arnold Palmer designed RiverTowne, Dunes West, Charleston National and Shadowmoss. You will not be disappointed playing any of these courses so when you think about Charleston, go ahead and think about history. But remember there's some great golf history here too, and it's still being made today. Charleston is as great golf destination to bring your spouse with you. Try the Charleston Art Tour, a two hour walking tour to the most exciting fine art galleries in the historic French Quarter. Be prepared to be inspired. Get all the details at www.charlestonarttours.com.